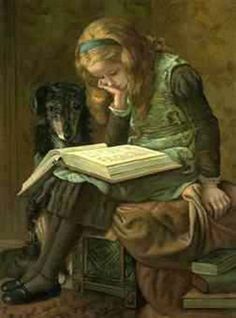 Girl Reading a True Story to her Dog. 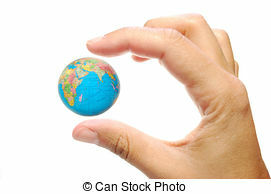 Prior to World War II, my world was pretty small. “Current Events,” at our grammar school consisted of our “Weekly Reader” that gave us a peek into new inventions, the World’s Fair on Treasure Island, and our beautiful Bay bridge - -that the powers that be had promised that they would remove the toll charge as soon as the bridge was paid for. When World War II happened, my world became a bit larger. Each week at our school assembly, we were shown propaganda films about the war that was supposed to enlarge our patriotism. It did that and at recess we would sing songs about Hitler and in his face. The war was over and time went by and in the eighth grade, our teacher requested that we bring a blank scrap book to class and collect current events from the Newspaper. The most exciting event was that of Israel being declared a nation. My mother helped me collect the articles from our local paper. Remembering back in high school, our government teacher urged us NOT to give away our right to vote. Read carefully the propositions and do not allow appointments to be made because that is removing the control from the people she said. Government is by the people and for the people !! As time went by and voters became more and more lazy and not involved, appointments were made and today many corrupt leaders have overruled the will of the people. Propositions have been voted into law by the people, and “One” judge or President can decide to void the entire law and make a different one that is opposite of what the people have voted on and won. All around us is enough corruption to cause us to not read our head-lines or the news page on our computer or watch the news on TV. Yet, please do NOT give up. I am reminded that God is still on His throne. As Christians, we need to pray that our leaders will have wisdom to make wise choices and it behooves us to use common sense, keep our eyes open as we go to the polls to vote. We may not get on a soap box, but we can let our voice be known by our vote and hope that it will matter. My husband writes letters to the Editor and they get published !! It seems that his world was too large. I think it's a fine balance sometimes between being uninformed about world news, and being overly concerned about it. I've tried to strike a balance between knowing enough to be intelligent and involved, and yet, refusing to get sucked in by the rhetoric. And, I pray for our country and leaders, knowing that in the end, the Lord is the One who reigns supreme. My how the times have changes… and so quickly. Truly, this life is a breath. Thanks for the encouragement to do our part. To share in love and put our faith in our Father… not in mankind.